Winter has returned and it is hard to convince mares that it is time for foaling and getting pregnant! The cold weather makes it difficult on all fronts! With cold winds rain, sleet and snow forcast into next week it is hard to believe that it is actually the beginning of the Flat Season next Sunday. How the ground workers at the Curragh racecourse can get the track ready after all the rain remains to be seen. It will certainly be very testing conditions if racing can go ahead. Fitness will play the main part in winning the races on Sunday as none of the horses trained on the Curragh have yet had the chance to work on grass. Susiescot, raised at Swordlestown Little and now in training with Willie Mc Creery is scheduled to take her chance in the Irish Lincoln Handicap. 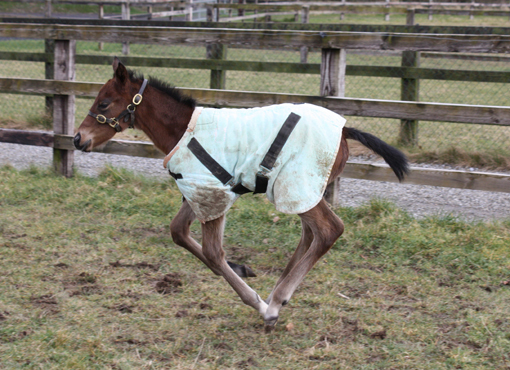 She has run well on heavy ground before and has a low weight that will give her a chance to finish in the frame. It has been a difficult time on stud farms, mares tend to foal later in this bitterly cold weather and some of the non-pregnant mares have stopped cycling alltogether. Third Dimension took that point to an extreme when setting a record here with 373 days of gestation for her foal. 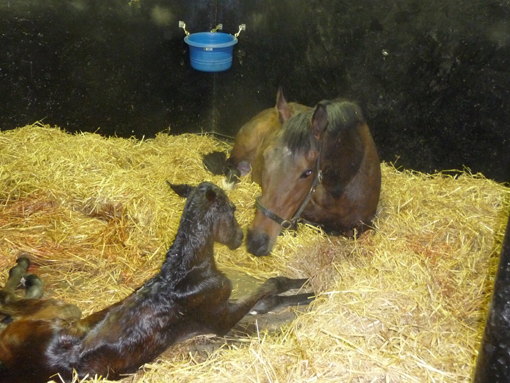 We were very relieved to see her deliver a healthy, big colt early on Wednesday morning. Mother and baby are fine. 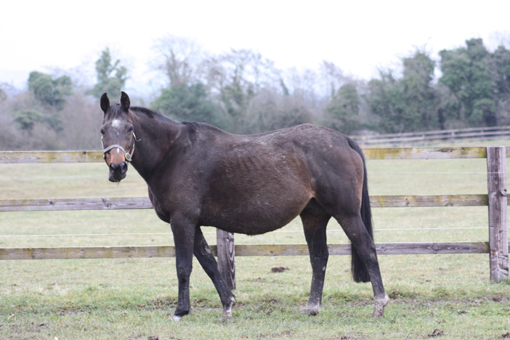 Khatela is also overdue and we cannot wait to see our first Lilbourne Lad foal. The word is that they are good-bodied, strong and correct types. Fingers crossed! In the meantime his sister is rapidly growing and looking very much like him. Another one in the maternity ward is Theola who has returned from France to be covered by the new Darley sire Helmet (by Exceed and Excel) She is carrying a foal by Elusive City. 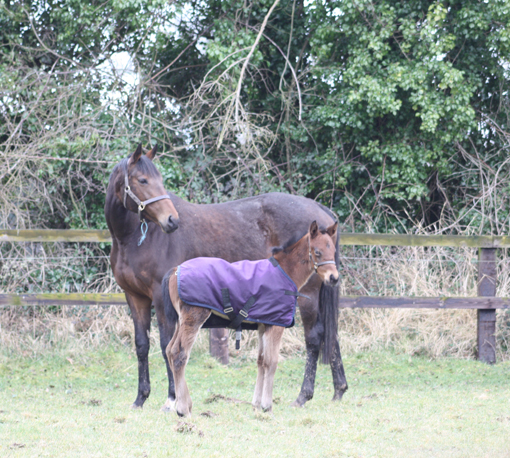 Sogno Verde and foal braving the horrible weather. 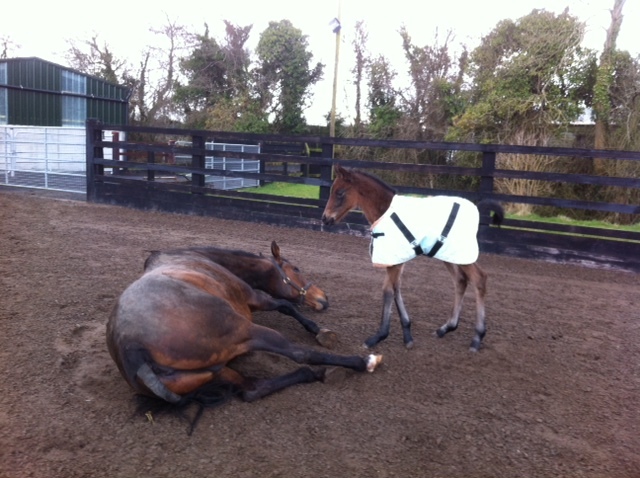 In order to allow young foals to be out most of the day, we put rugs on them to keep them dry and warm. Poor Khatela carrying a heavy load!